Award-winning filmmaker is making a fresh attempt - and this time it's personal. From L to R: Filmmaker Jim Sawatzki, HOD Museum Director Chris Siriano, and the last of the barnstorming players Lloyd Dalager. RIVERSIDE - Work got under way last month on a new attempt to produce a documentary about the Israelite House of David religious colony in Benton Township. Award-winning filmmaker Jim Sawatzki of Colorado was at the House of David Museum in Riverside and at the colony grounds to do some work on the documentary and to get started on a short promotional piece for the film. Many of the interviews for the 60-minute film have already been done. While plenty of archival material is available, the hard work of organizing everything is just getting started. "It's just mind-boggling," said museum founder Chris Siriano. "Piecing all that stuff together to tell that story, and in one hour, which is absolutely absurd. It's like trying to compile every story in the paper about the House of David into one story." Fortunately, Sawatzki is "good at that," Siriano said. "He's really good with a history documentary." Sawatzki, who has lived in Colorado since 1971, said the work isn't easy. "We hope to present a nice little definite history," Sawatzki said during an interview at the museum. "That's kind of tough to do in an hour. That's a challenge. You've got thousands of things in here. There are books written on it, so you have to condense it down and make it a story that will be entertaining, but will also teach people about what this was." Award-winning filmmaker Jim Sawatrki of Colorado has been at the Israelite House of David colony in Benton Township and the House of David Museum in Riverside in preparation for a one-hour documentary on the colony. The film is personal - he's a Benton Harbor native who often visited the House of David Amusement Park as a child. 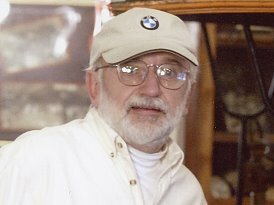 Sawatzki's work has been shown on PBS stations and one of his documentaries, "Treasure of Cripple Creek Mining District," was nominated for Best Historical Documentary during the 14th annual Heartland Emmy Awards in September 2000. He said the House of David film will be his 13th documentary. But for Sawatzki, this is a personal effort. He is a Benton Harbor native who often went to the House of David Amusement Park as a child. "I rode the train and the cars," Sawatzki said. "I remember going to the variety shows when (master of ceremonies) Chic Bell was still on stage. Later on, as a teenager, you'd go out to the bowling alley and do the arcade. I spent a lot of time at the House of David. Those are pretty good memories." Sawatzki graduated from St. John's High School in Benton Harbor in 1965, and from Michigan State University in 1970 with a bachelor's degree in art education. St. John's later combined with St. Joseph Catholic High School to form Lake Michigan Catholic Schools. Siriano said he and personnel from TGA Recording in Benton Harbor have been interviewing colony members and others for the documentary. 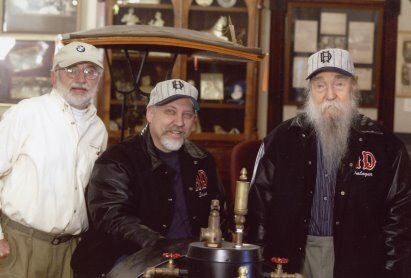 The interviewees include: Lloyd Dalager, 94, the current president of the House of David; baseball player Ike Bohn of Sodus; Donnie Robertson, who used to run the mechanical music museum at the Amusement Park; Charlie Antanapolus, who was born and raised at the colony, and Hettie Purnell, 92, the only living granddaughter of colony founders Benjamin and Mary Purnell. Siriano said Hettie Purnell was raised in the Shiloh house, but hadn't been back there since the 1920s. Purnell, who lives in St. Joseph, returned to the vast building for the interview. "That's the most unbelievable day I've spent in years," Siriano said. "Her stories are unmatched with anything I've ever heard. She was right there with (Benjamin and Mary), and we've got her on film." Also available for the documentary is old movie footage, "lots of it," Siriano said. That includes baseball games, the old "pepper games" that the ballplayers used to amuse spectators, Grover Cleveland Alexander "pitching, and cracking jokes and playing the pepper game himself," and the House of David basketball team, he said. There is also footage of the colony's Sunset Motel in McAllen, Texas, and a scene of a House of David band playing on the steps of New York City Hall, Siriano said. Siriano said that anyone who has old movie footage of the colony should contact him at 849-0739. The museum has plenty of still photos but hasn't been able to find any movies of, for example, a House of David band playing on stage at the Amusement Park, Siriano said. If anyone has footage that the documentary can use, they will get credit in the documentary, he said. But first comes the finishing of the promotional piece. That will be done within a month, and then the fundraising starts. "We're going to take it to basically everybody we think might be interested in trying to help," Siriano said. That will include foundations, businesses and individuals, he said. Sawatzki has had plenty of experience in raising funds. He said he prefers to go to foundations and businesses rather than to trying to get government grants. "I've done grants," Sawatzki said. "Most of the time, by the time you've filled out all the information and sent in all in, and done the hoops, by the time they tell you �no,' you could have done the thing." Sawatzki said the project, will take about $100,000. Siriano said Sawatzki is willing to do the work "for a substantially reduced amount" because of his personal interest. The Israelite House of David colony was founded in Benton Harbor by the Purnells in 1903. After Benjamin Purnell died, Mary Purnell in 1930 founded the Israelite House of David as Reorganized by Mary Purnell, usually known as Mary's City of David. The City of David has its own museum, which is open in the summer, and also offers colony tours and vintage baseball games in the summer. The colonies, which believe in a millennialist Christian religion, became an important part of Southwest Michigan history. The colonies are next to each other in Benton Township. While both are down to just a few surviving members, they are still operational and the grounds are private property. 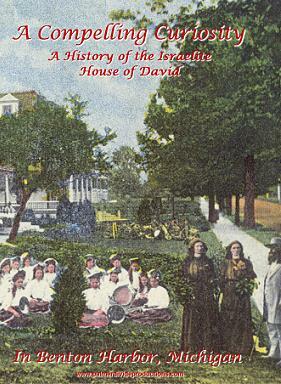 a history of the Israelite House of David"
Born and raised in Benton Harbor, Mich., Jim Sawatzki remembers visiting the House of David as a child and ordering potato pancakes at Mary's Vegetarian Restaurant. "I went there every summer," he says. "It was a nice place to grow up. I experienced the miniature trains, the zoo. I remember eating the wonderful ice cream cones:"
So when Chris Siriano approached him with the idea of making a documentary about the religious colony, Sawatzki jumped at the chance. "I have a connection with it;" he says. In its heyday, Sawatzki says the House of David owned trolley car and steam ship companies and a lumber mill. "They catered to tourism and the public;" he says. "Everything they touched prospered:"
Sawatzki attended Michigan State University and graduated in 1970 with a degree in Art Education. He moved to Colorado and taught art for 15 years before starting his own company in 1994 called Palmer Divide Productions. He began making historic documentaries about local Colorado towns. "I realized a lot of local histories are really important and just as interesting as nationally big stories," he says. "I thought there was a need for something like that." Sawatzki has made 12 documentaries, one of which was nominate for an Emmy. He is currently looking to secure additional funding to complete the House of David documentary. - YR.